As the world’s largest nonprofit funder of Parkinson’s research, The Michael J. Fox Foundation is dedicated to accelerating a cure for Parkinson’s disease and improved therapies for those living with the condition today. The Foundation pursues its goals through an aggressively funded, highly targeted research program coupled with an active global engagement of scientists, Parkinson’s patients, business leaders, clinical trial participants, donors, and volunteers. In addition to funding more than $700 million in research to date, the Foundation has fundamentally altered the trajectory of progress toward a cure. Operating at the hub of worldwide Parkinson’s research, the Foundation forges groundbreaking collaborations with industry leaders, academic scientists and government research funders; increases the flow of participants into Parkinson’s disease clinical trials with its online tool, Fox Trial Finder; promotes Parkinson’s awareness through high-profile advocacy, events and outreach; and coordinates the grassroots involvement of thousands of Team Fox members around the world. 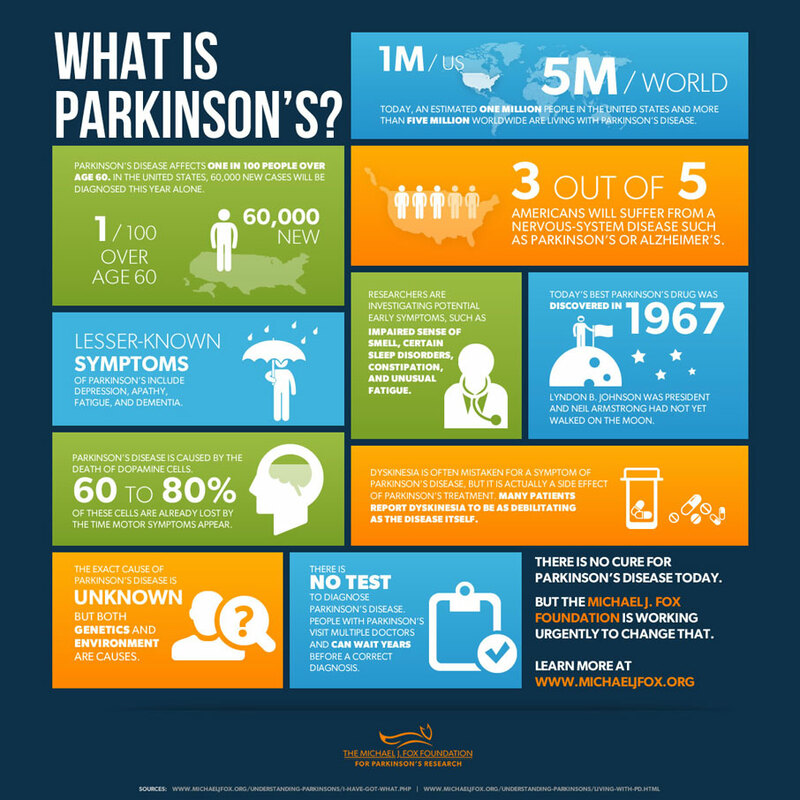 Parkinson's disease is a degenerative brain disorder with symptoms typically progressing from mild tremors to complete physical incapacitation. In addition to the disease's motor symptoms, PD can also cause issues with sleep, digestion, cognition, and depression. Parkinson's is the second most common degenerative brain disease, after Alzheimer's. One in 100 people over 60 have PD, but some are diagnosed with young-onset at 40 or younger. There is currently no cure for Parkinson's disease. The Michael J. Fox Foundation relies on the power of our community and their dedication to help us reach our ultimate finish line. Beyond our passionate network of supporters, health advocates, research leaders and heads of industry, there are thousands of individuals doing their part as grassroots community fundraisers. Since 2006, over 12,000 community members have joined our Team Fox grassroots fundraising program, our official Team Fox sponsored athletic teams, our Fox Trot 5K Run/Walk signature events and our Tour de Fox cycling series; raising more than $65 million. Thanks to the generous support of an anonymous donor, 100% of the proceeds raised through our community fundraising efforts go directly to the Foundation’s programs to speed a cure for Parkinson’s disease.